Lachie Turner is one of a number of exciting back-three prospects in Australian rugby. Turner has forced his way in to Test reckoning for the Wallabies after several successful seasons with New South Wales and the Waratahs, his raw pace and stepping ability making him an excellent attacking option. A graduate of Newington College, Turner was capped by his country at Under-19 level in 2005 before announcing himself as one of the brightest young talents in Australian rugby with a string of eye-catching displays for the Waratahs during the 2007 Super rugby season which ultimately resulted in him being named rookie of the year. Despite calls from some quarters for him to be included in the Wallabies squad for the World Cup in France, the then 20-year-old winger was left at home. However, he was finally handed his first start for his country the following June, Turner starting on the right wing in a victory over France in Brisbane. His first try in gold arrive during that year's November internationals, with Turner notching against Italy in Padova. 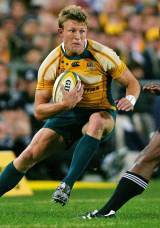 He dotted again against the Azzurri in the summer of 2009 and he went on to start five games for the Wallabies during a disappointing Tri-Nations campaign. Turner was then dropped for a succession of games by head coach Robbie Deans before being recalled for the September 2010 clash with the All Blacks in Sydney following a spate of injury-enforced withdrawals. Turner failed to excel but he subsequently played a key role in Australia's triumph in the Commonwealth Games Sevens tournament, thus sealing his place in the Wallabies' squad for their end-of-year tour. In September 2010 Turner beat the likes of rugby league speedsters Jarryd Hayne and Ben Baba in a battle-of-the-codes race over 100 metres - which was attended by sprint king Usain Bolt - to earn himself the unofficial title of the fastest man in Australian football.